Last winter while snowshoeing the Diamond Creek Falls Trail, my friend Kathy and I decided we needed to do the hike in the summer. It was the first time either of us had been on this trail so we wanted to experience it without the snow which we did Labor Day weekend. 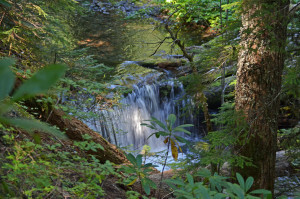 The hike is 2.5 miles on a loop trail, easily marked and includes views of three waterfalls. Diamond Creek Falls is the one you can get up very close to at the bottom of the falls. We took the loop path to the right so the first of the waterfall is off in the distance with viewing between the trees. 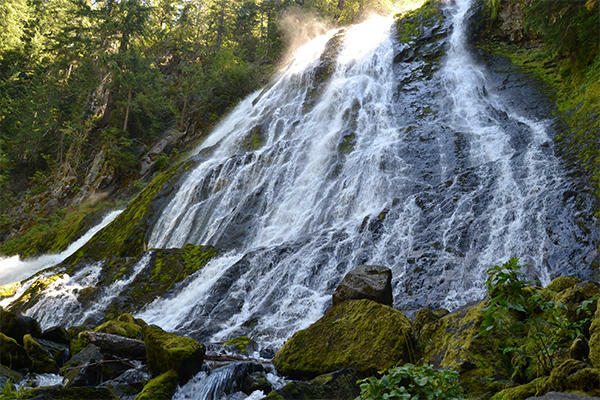 The second falls aren’t very large, but they are in a scenic serene spot that is off the main trail. The third falls on this trail are Diamond Creek. During the winter we didn’t hike to the bottom because the trail was a little steep for our first snowshoeing adventure and you can see the falls from the main trail. However, now we could easily navigate to the bottom and it was so worth it. The falls were beautiful with the sun at the top and cascading down the rocky cliff. 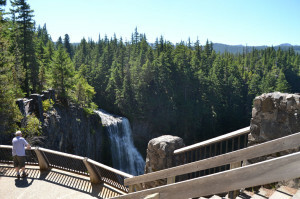 The day wasn’t complete until we hiked one more trail at Salt Creek Falls. 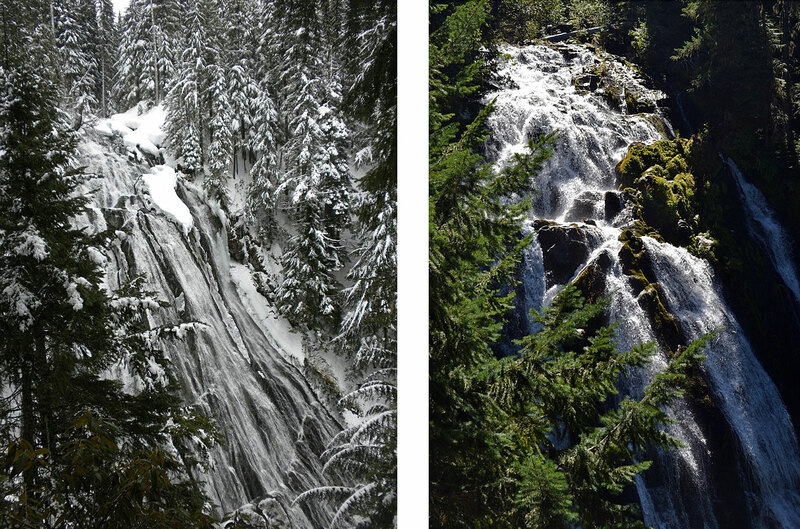 Both of these trails are accessed from the same parking lot at Salt Creek Falls off Highway 58. Salt Creek Falls is the most accessible with a paved path to the viewing area, but there is also a short trail that takes you closer to the base of the falls with some great views. We had never gone down that path so it was time for something new and we decided it was well worth the steep hike. It was a great way to spend time photographing waterfalls and taking a beautiful hike. 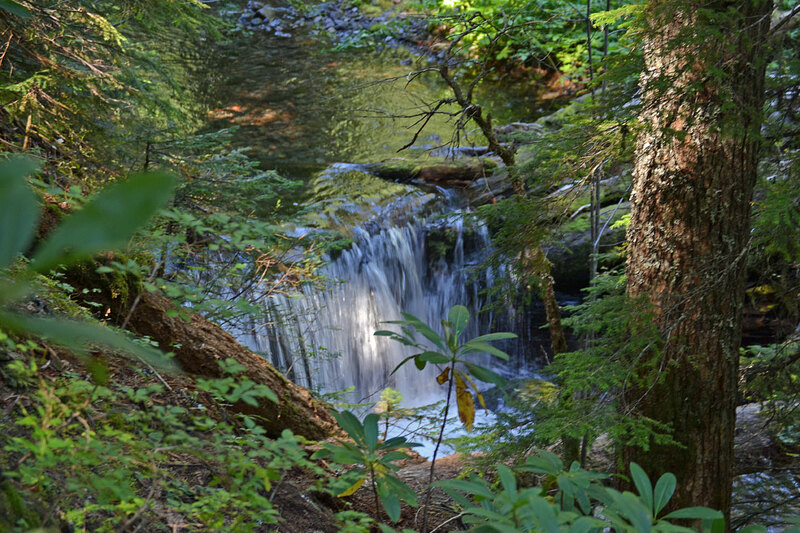 The Diamond Creek Falls Trail is an hour and twenty minute drive east of Eugene along Highway 58. Stay at the nearby Oakridge Lodge & Guesthouse. Stop by the Oakridge Brewers Union Local 180 for craft beer and great food. Bon Appetit Magazine named the Brewers Union one of the Best Nanonbreweries in the Country. Don&apos;t forget to pack your mountain bike. The International Mountain Bicycling Association (IMBA) designated Oakridge silver status as one of their first Mountain Bicycling Ride Centers (there are only seven world wide). 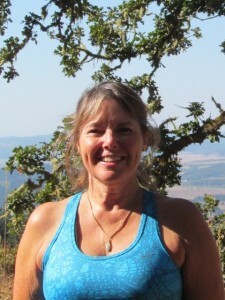 About the author: Sally McAleer is the Vice President of Integrated Marketing for Travel Lane County. Rain, snow or shine, Sally’s best days are always spent outside. 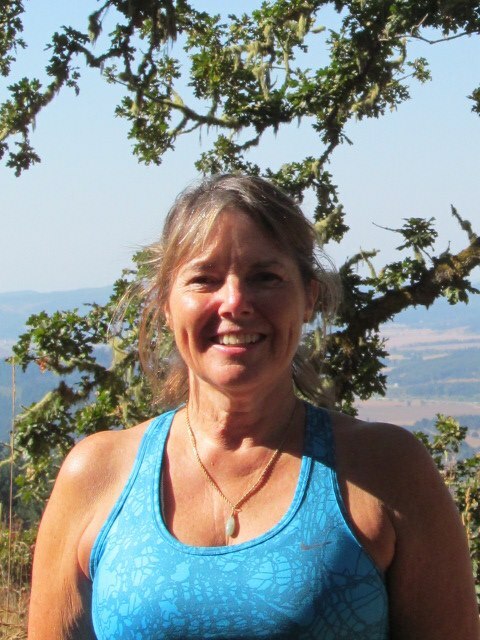 She runs, bikes and hikes in the summer and snowshoes and skies in the winter.